I happened to be in Mountain View, CA for a short time on a business trip during the launch of the iPhone 4S. It was later in the day and I was thinking of leaving the office to get some dinner. Before I left though, I checked my news feeds to see if anything interesting was happening. That is when I read this article. Steve Wozniak, the creator of the Apple // and one of the founders of Apple was in line to buy an iPhone 4S at the Los Gatos Apple Store. That was only about a 20 minute drive from where I was. This was my chance to meet someone who had seriously influenced the direction of my life. I recently finished building my Replica One which is a replica of one of Woz’s first computer designs, the Apple 1. I grabbed a copy of a schematic of the Apple 1 and printed it out before leaving the office. My plan was to see if I could get him to sign it for me. 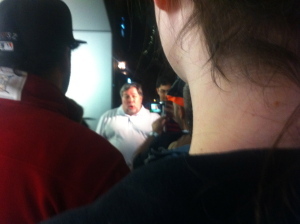 Once I arrived, I found Woz surrounded by a dozen or so people. And true to form, he seemed to be spending most of his time talking to the kids who were asking him what they should do be an engineer and build cool things. He gave great advice and I wish I recorded some video of what he was saying. I used my phone to get some pictures of him but it was tough with the low light and the crowds. Only two pictures ended up almost reasonable. After he talked to a bunch of the kids, someone asked him for a picture and then another person on the crowd asked for him to sign something. I had my schematic, an iPad 2 which I was going to use as a surface for him to sign on and my pen in my hand. After a couple more people got their pictures or something signed, I got his attention and asked him to sign my document. I passed him the iPad 2 and schematic but he had a pen ready to go. After starting to sign, his eyes focused more on what he was signing and he said “Hey, this is my design!”. I said it was significant to me because I had just assembled a Replica One and I planned to put the signed document next to my little piece of computer history. He said he loved the Replica One and thought it was great that some people still put systems together like they did back then with a soldering iron. He finished signing the schematic and passed it back to me. I thanked him and probably had a crazy grin on my face and he went on to posing for more pictures or signing anything people brought to him. Once I got home, we bought a frame for the signed schematic and it sits right now next to my Replica One and it reminds me often of the chance I had to meet Woz. This entry was posted in Technology on October 13, 2011 by jrand. I had already assembled my Replica One and powered it up to see that it worked. But, it was just a bare board. I had it connected to a power supply and a small USB keyboard. The Replica One didn’t have USB so I had it connected through a USB to PS2 adaptor. The whole thing sat on top of a piece of cardboard. It worked but it looked more like a bomb from a movie than a working computer. It needed a case. Years ago, my dad and I build the Rand X computer together and that is where my hobby and my profession work in software began. I assembled the Replica One with help from Matthew. But I wanted a nice wooden case and for that, I wanted help from my dad. We were planning a visit to Tillsonburg that summer so I prepared by drawing out a basic plan. I measured the key components. The motherboard is rectangular and I decided it would be best to have the long edge of the board run along the length of the case. The power supply would be to the left of the motherboard. Unfortunately, the power switch, serial port and video output would then have to come out the right hand side of the case. In the end, it seemed to be the best compromise so that is what we went with. I arrived in Tillsonburg with some rough plans. It called for a shape which is more or less a rectangular box except the front, top slopes down where the keyboard is mounted. This approximated the shape of the Apple //. 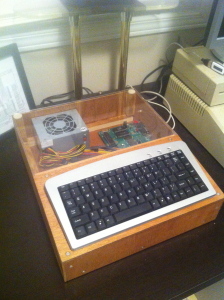 Also, I wanted the top of the case to be plexiglass so the board would be visible. We sourced the plexi in London and went to pick up a piece. They cut it to the size we specified and when I asked, “how much?” they said not to worry about it. They had scraps bigger than that. We cut the panels to the appropriate sizes and shapes and screwed it together. We cut a large hole in the back panel for the power supply fan and power connector. We also cut a smaller opening on the right edge for the connectors on the motherboard. We probably struggled the most with finding a good way to mount the board to our case. We ended up with small spacers which we screwed into the board and then screwed the spacers into the bottom of the case. It wouldn’t be too convenient to remove the board from the case but I didn’t plan to do that very often. We drilled a small hole for the keyboard cable to pass through into the case so it could be connected to the board. Mom had some velcro which we often uses for their boat projects and we used to that connect the keyboard and the plexi to the case. After a couple of coats of varnish, we had a beautiful case for my Replica One. Once I got the system home again after our trip, I remove the old piece of cardboard that everything used to sit on and cleared a spot for it on my desk. I hooked up the serial cable to the iMac and started loading programs onto it. I even got a C compiler working for the Replica One and I have coded a few things for it since then (more stories coming about that soon). So, it sits beside me now in my computer room. I have many old computers here but it has a special place physically on my desk but also it means so much to me because of the work which went into it by Matthew, my dad and I. This entry was posted in Technology on October 1, 2011 by jrand. This summer, we have had lots of visitors here in Ottawa and we have travelled ourselves to see friends and family. Cynthia’s grandparents from Montreal came to visit early this summer and we all met for a wonderful dinner out. My mother came to visit for a weekend and Cynthia’s dad and Nannette also were in town at the same. You can see some pictures at a park where many of us took turns on the swings. Both my mom and dad came for a visit in July and then by the end of July and into August, we travelled to SW Ontario. We stayed at mom and dad’s place where dad and I worked on a special project which I will have to post about separately. Also, we had a chance to see my brother, Katherine and James, my nephew. While there, we caught up with Jeff who is an old friend who I don’t get to see often enough these days. 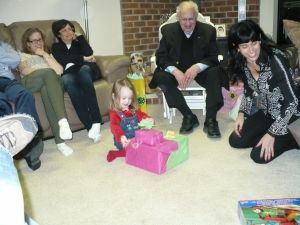 We also spent an evening with Erin and Dennis and their kids who moved to London from the Ottawa area not long ago. You can see some pictures of Dennis and I making some noise with a couple of guitars and having a great time doing it. Over the long weekend just past, Steve, Katherine and James came to visit which was their first time to see our new house since moving back to Ottawa. James was lots of fun and helped us by pointing out all of our doors. While he was hear, we engaged to child locks on the cabinets in the kitchen which was always good for a laugh when Cynthia and I would forget and struggle to open the door. I don’t have any pictures from that visit up yet but hope to soon. Now with school started again, most of our summer visits are done. Hopefully we had a chance to catch up with you but if not, drop us a line or stop by some time. 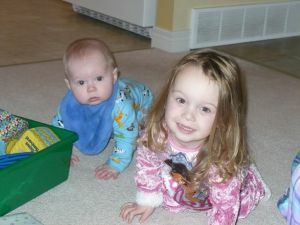 This entry was posted in Cynthia, Jeremy, Matthew, Samantha on September 7, 2011 by jrand. A short distance from our new house is a great tobogganing hill. 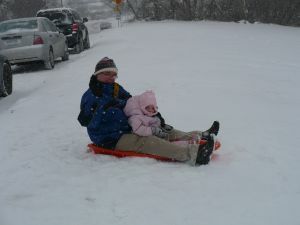 So, we picked up a couple of sleds and took the kids a couple of times this winter. It is a reasonable walk for Matthew and I from the house to the hill. The walk becomes unreasonable when you end up having to carry Samantha and pull the sled though. The second time we went, we drove if only to avoid a cold walk back when everyone is tired. The hill starts at the edge or a residential road and drops down a good distance to a soccer field. So, when you are heading down the hill, you don’t have to worry about running out into traffic. You can just keep going until you run out of momentum. Matthew went up and down that hill too many times to count and just didn’t stop until we said it was time to head home. Samantha went down the first couple of times with me but after that she started going down by herself. But, that didn’t mean I could stay at the top of the hill. Instead I had to go down to the bottom and pull the sled up for her next run. Sometimes, she would be tired and sit in the sled for me to pull it and her up. Afterwards, we would head home for some kind of treat. For some reason, we had ice cream after a cold day tobogganing as you can see in the photos. As the kids get older, they will be able to go the hill on their own and spend some of their winter days there the way my brother and I used to do at “the hill” next to his friend Greg’s house. This entry was posted in Cynthia, Jeremy, Matthew, Samantha on May 9, 2011 by jrand. Months ago, Christmas Day came and went and although we took a few pictures I hadn’t gotten anything up on the website. Until now. Matthew was very happy when he found a couple of Lego sets under the tree. But, he also got some other interesting toys like some Snap Circuits which lets you make simple electric circuits from some standardized snap-able pieces. Samantha got a electronic dog which still drives me crazy. If she leaves it on, it will bark when its light sensor detects a change in the lighting. So when I turn the lights out at night when I go to bed, suddenly this fake dog barks and often makes me jump. When its batteries die, I don’t seem to rush to replace them. Christmas evening, Cynthia’s mother came to visit and help me with a turkey dinner. I can’t recall anything much about the meal after all these months so I assume it was uneventful. I am sure I would remember if I ruined the dinner somehow so I guess I pulled it off OK.
With Christmas over, we had to prepare for our trip to visit Cynthia’s dad at his place near Collingwood where we stayed until just before New Year. Unfortunately I was feeling very under the weather with a terrible cough so I mostly just stayed around the house resting. But Cynthia, her dad and Matthew spent quite a bit of time skiing. Samantha went skiing one of the days also. Actually, she mostly was held up and chaperoned down the hill but she had a great time. We have some video also of Samantha and Matthew skiing also. Matthew is pretty much ready to try something a bit harder than the bunny hill. Because it is such a shallow hill, you will see that he just goes straight down. Something a bit steeper would hopefully put a bit more fear into him and convince him to make some turns. 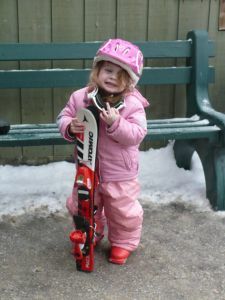 The kids had a great time and I am sure they would love to visit again next year and try some more skiing. Thanks for your hospitality Steve and Nanette! One of the last things I did before we moved back to Canada was order a Replica One computer. The Replica One is a reproduction of the original Apple I computer designed by Steve Wozniak back in 1976. Shipping it to Canada would have been more expensive and more of a hassle and I always wanted one so I bought the kit. But with the move, I left everything in the box until I was ready to work on it. Once we were settled, I was itching to start but I just didn’t have the room. I had my own room for my gadgets but I only had a tiny desk which had room for our iMac and printer but not much else. I really needed all new office furniture and a large desk to go with the large room. By September, I had found the furniture collection I wanted and ordered it online. But months later, it was still back ordered. Someone didn’t want me to work on my computer project. By November everything arrived and in a couple of evenings of work, I had the furniture all assembled. With desk space, I decided to bring out some of my other old hardware. Like the Apple //GS I used throughout university and have completely customized in a tall tower case. Or my uncles old Apple //e which needed a bit of cleaning but still works great. My BeBox which replaced my Apple //GS as my main computer when I started working life. The BeBox is probably the rarest machine I own and the model I have is thought to be one of about 800 ever sold. But, while waiting for room to work on my project, I also started collecting some other old systems. I found an original Mac 128k on eBay and bought it. I have a video of Samantha using it in the kitchen. Now it has a permanent spot next to our iMac which is many orders of magnitude faster. It works well and Samantha often asks to use it. She loves MacPaint. I also got a Apple MessagePad 2000 on eBay. These devices are often called “Newtons” although it is the software on them that is branded Newton. The hardware is MessagePad. It is a strange device and ahead of its time in many ways. The Palm Pilot which followed it is definitely a refinement and simplification of the MessagePad and it succeeded because it was a better compromise for size, battery life and cost. But it is a pretty neat machine and in some ways is a predecessor of the much more successful iPod and iPhone mobile devices which Apple would make much later. The final machine I bought off eBay recently was an Apple Lisa 2. This is quite a rare machine and is a predecessor of the Mac and is one of the first machines with a graphical user interface. The model I have has a single 400k floppy drive and a 10M internal hard drive. The hard drive is physically huge. Given that 3TB hard drives exist today, you can probably have about 12TB of disk space in the same physical dimensions as this 10M drive. That is about 1,250,000x more capacity in the same physical space. The machine itself was in Ottawa so I was able to inspect it before bidding on it and once I had won it, I didn’t have to pay shipping costs since I just had to pick it up. It was missing a keyboard but I found one in another auction. The system does power up but it doesn’t boot. There is definitely an error booting to the hard drive but I am not sure what the problem is yet. It could be that the OS isn’t loaded on the hard drive which means I have to find some way to write some floppies. That alone will be an interesting challenge. The only other machine I am tempted to try to find is a Next Cube but they are rare enough that they tend to go for $1000 or more. I just can’t justify that much money for something that old, regardless of how cool the hardware is (or was). But what I really wanted to work on was the Replica One. I setup the desk and put some of my old machines together in the corner of the L where I could work with them but they also wouldn’t be in the way too much. The iMac sat on on end of the L leaving the other side empty. Also before moving, I bought a very good soldering iron at Fry’s so I set that up. I put a nice bright desk lamp there also to help me get enough light. I was bit nervous to start since it had been years since I did any soldering and never really did anything this intricate. I watched a bunch of YouTube videos on soldering technique just to review and prepare. One night a couple of weeks ago, I opened up the box and organized all of the parts. The instructions suggested starting with the resistors and there were only a dozen or so to mount so I dove in. In a short time, I had all of the resistors mounted. The next day, I soldered all of the sockets. Then, the capacitors. A day or so later I was soldering on the connectors and other devices. Every day, I would show Matthew the progress and demonstrated soldering for him. But once all of the soldering was done, Matthew would help me out more. First, we needed to make sure that the connections were good. Without inserting any chips into the sockets, I hooked the board up to the power supply and turned it on. We got a red light from the LED which was a good sign. Using the voltmeter, Matthew and I checked +5 and ground on all of the key pins. Everything looked good. Time to power it off and move to the next step. With bedtime fast approaching, we started mounting the chips into their sockets. 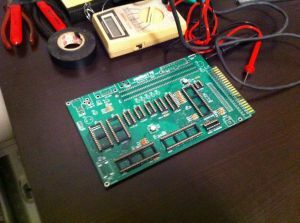 There were only 10 chips to insert (versus the dozens of chips found on the original Apple 1) but it was slow going because we didn’t want to bend any pins. With all of the chips mounted and Cynthia ready with the video camera, it was time to power it up. And it worked! A quick reset and I was in the monitor. A quick instruction in the monitor and I was in Apple basic. A quick command in Apple basic and I was running a program. We had built a computer! In many ways, this project was a way to relive the building of the Rand X computer my dad I built nearly thirty years ago. The Replica One is actually less powerful than the Rand X. My Replica One has 32k of memory versus the 64k we had in the Rand X. But my Replica One is also built to interface better with technologies of today. It has a PS/2 port for a standard PC keyboard. It has a serial port which you can use to send it programs. I am currently waiting for a USB to serial cable so I can hook the iMac up to the Replica One and downloads some programs to it. And I bought a compact flash reader for the Replica One. This lets me store programs on a compact flash card. The Apple 1 never had a disk drive. All it supported for storage was cassette tape. Compact flash is a much more convenient solution. However, it was difficult finding a good flash card to buy. The problem is that regardless of the size of the flash memory, the reader will only give you access to the first 32M of space. In the store, the smallest and cheapest I could find was 4G. So, I now have a 4G compact flash card inserted into a device with 32k of main memory. Of that 4G, I can use only 128th of it and of that 128th, I will be hard pressed to use even a megabyte of space. Matthew has shown some interest in learning more about the Replica One also. I showed him just a bit of Basic and how he could use it to write programs which can do his math homework for him. That seemed to get his attention. I often wonder what the best route is to get a child into programming today. Making a program which counts from 1 to 100 on today’s machines just seems so anti-climatic. But to get a machine which is nothing more than a bare circuit board hooked up to a keyboard and monitor to count to 100 just seems like more of an accomplishment. At least I think so. We will see whether Matthew thinks so too. The next step is to build a case for it. Today it is sitting on a piece of cardboard but my plan is to build something out of plexiglass. I also need to find a keyboard which is a bit smaller and more appropriate to mount into the case. So my Replica One joins my museum of old technology. But unlike the other ones, this one is just a bit more unique because we assembled it ourselves. This entry was posted in Technology on January 3, 2011 by jrand. With Matthew’s birthday past, Christmas was coming quickly. So, I took an afternoon off work and our plan was to take Matthew and Samantha to see Santa and pick out a tree. 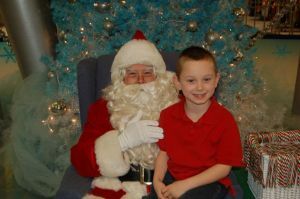 Thinking that getting to the mall early would beat the line for Santa, we arrived to find that Santa didn’t arrive until after dinner time. So, instead we went in search of a Christmas tree. Not far away, we found a lot with some nice trees and did a bit of browsing. Normally we get a very tall tree but this year we opted for something a bit smaller. That way, we could more easily fit it in the trunk of my car and we had a perfect spot between the stairs to the second story and the stairs to the basement where a small tree would fit. 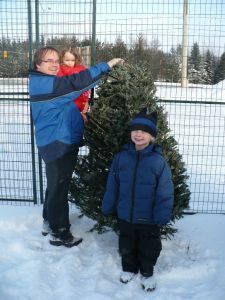 The tree we picked was just about my height so not tall. A couple of bungee cords later and it was secure in the trunk of my car. We headed home to drop off the tree. Now the plan was to leave the tree at home, get back to the mall and find something to eat and then get in line for Santa. After a quick dinner in the food court, we got the line up about 10 minutes early to find only one other family in line. So, shortly after Santa arrived, Matthew and Samantha were confiding in him their wishes for Christmas day. Later that week, we decorated the tree. Having the tree right beside the staircase made it very easy for Matthew to put the star at the top. We bought another strand of lights this year because we always found the bottom just a bit too bare with our larger trees so this year, our tree had lights to spare. We were all ready for Christmas. This entry was posted in Cynthia, Jeremy, Matthew, Samantha on January 3, 2011 by jrand. In early December, we made our first trip since getting back to Canada to Montreal to see Cynthia’s family and celebrate Chanukah. Many of the people there we hadn’t seen in a very long time and it was great to catch up with everyone. Although the winter months aren’t the best, being back in Ottawa and close to family and friends is worth it. 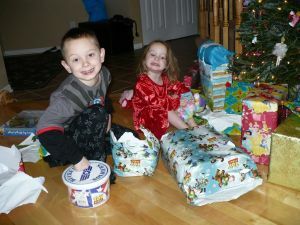 Matthew and Samantha were very happy with their Zhu Zhu Pets although Cynthia’s Nana thought they looked a bit too much like rats. We look forward to our next visit to Montreal to see everyone there. For Thanksgiving weekend, we travelled to St. Thomas to visit with my parents, my grandmother and my brother and his new family. We were able to be at Steve’s wedding to Katherine which was about a year and half ago now. But, we hadn’t yet been able to meet James, their new baby boy. So, we were very excited to make the trip to catch up with everyone as see James. We took the kids to an Great Lakes Farms and picked lots of apples. Matthew and Samantha picked so many apples, we still have about a half dozen in the kitchen waiting for someone to eat them. The kids played on some bails of hay while the adults rested and enjoyed some cider. The next day, we went to Ferguson’s Produce and picked up some pumpkins. We also turned some of Samantha’s old clothes into a little scarecrow and Steve, Matthew and I spent some time lost in a corn maze. When we found our way out, we saw that Samantha had her face painted to look like a pink cat. Jeff who used to live next door when I grew up in St. Thomas stopped by for dinner that evening. Later, Jeff, Steve and I went out for a few drinks and to catch up. Congratulations on the new sailboat Jeff. The next day, we went to my parent’s house for Thanksgiving dinner. Katherine and Cynthia had talked about how both of them love sushi so on our way, we got some food at Take Sushi Korean & Japanese restaurant in London. It was very good although I did get a bit more wasabi in one bite than I intended at one point. Mom had a wonderful Thanksgiving dinner. 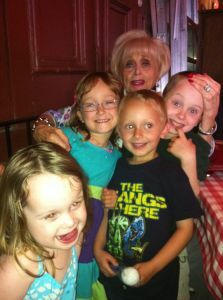 My uncle George and aunt Barb were there as well as my cousin Darcie who I hadn’t seen since we moved to California. With dinner and visiting done, we said our good-byes and headed back to St. Thomas to stay one more night with Steve, Katherine and James. It was a wonderful visit and it is so nice to be back so we can make a (relatively) short trip like that and see so many people who are important to us. Special thanks to Steve and Katherine who opened their home to us. Let us know when we can do the same. This entry was posted in Cynthia, Jeremy, Matthew, Samantha on October 17, 2010 by jrand. A couple of weeks ago, Cynthia’s dad and Nannette came for a visit. It was their first visit since we moved back. On Saturday, they joined us at our house and we gave them the tour. The next morning, we went to their hotel to enjoy the wave pool with them. Matthew went into the deep water and made good use of his goggles. Samantha played in the shallow water, jumping over the waves and just having fun. Afterwards, we had brunch with them in the hotel before we said our good-byes so they could make the return trip back to Toronto. Since then, we spent a night at their house in Toronto on our way towards the London area to visit my family for Thanksgiving. 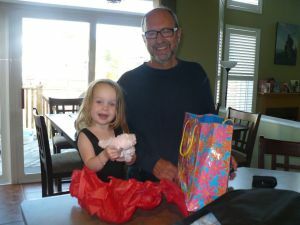 It is great being back in Canada and close to family and friends.